Blogging needs to change: it'll be totally worth it! I write blog posts. Sometimes I make mistakes. The most important ones are quickly pointed out in comments and fixed but others are never noticed (not important I guess). Still, it bothers me! So, before I hit the "Publish" button in Blogger, I have started to email a draft of the blog post to 2-3 experts in the field to get their comments first. They usually write back after 4-8 weeks and a few of their comments are really interesting, so it's totally worth it! They haven't found any mistakes so far, but they often ask me to add a few paragraphs tangential to the blog post topic. A few have even pointed out that the topics of some of my blog posts are not really in line with most of the posts on my blogs and have encouraged me to try to publish elsewhere. I never would have thought of that! Of course, once I make changes I send the draft back for their opinion, so there goes another 4-8 weeks - but it's totally worth it. If you noticed that I now post on topics that are a but bit out of date, now you know why. I found that I don't always follow the suggestions from the feedback and is that really fair? As an author I am hardly unbiased! So I started sending the feedback together with my thoughts on it to another expert and left the decision on what to change in his/her capable hands. Some of these people helpfully pointed out that it wasn't really fair that I picked the experts providing feedback, so they took on the task as well. Admittedly, this adds a bit more time to the process - these people have other things to do after all - but it's totally worth it. Also, these "decision makers" don't always feel I should publish my blog posts, so you've probably noticed a drop in the number of posts lately. Many of the mistakes in my blog posts that go largely uncommented are grammer and spelling mistakes. I know no one cares, but they bother me! Also, I feel my posts could do with help in the layout department. So I've started consulting an English major and a graphic designers at every step of the process. For example, I make sure a graphic designer comments on the general layout and quality of the figures even before the paper is looked at by experts and before I know whether I'll even get the blog post published! Also, I have someone reformat the entire blog post just before publication to give it that profession feel. Admittedly, quite a few mistakes creep in during that process - and I don't always catch them all - but it is totally worth it! Normally, I would ask you to alert me to these mistakes in the comment section - but my graphic designer has removed that section so send me and email! So far all these people are doing all this in their spare time as a favor to me and I don't really see how to continue like this. Especially the graphic designer and English major are starting to make noises about getting paid. I ^am really surprised that there isn't some kind of nifty startup with a sensible business model that could take all this off my hands. I would gladly give up copyright so maybe they could sell it somehow? I'm not a business major but I feel this could be totally worth it! Also, I put a lot of effort into my blog (now more than ever!) and I am a bit worried about the long-term stability of both Blogger and the internet in general. So I have started printing out my blog posts! This means shorter blog posts with fewer, if any, color figures but the sense of safety this gives me is totally worth it! So far this is just me doing these things - but I am personally convinced that they are important for the future of blogging. So convinced in fact that I would love to introduce some kind of legislation that would require everyone to do this. Alas I have found that legislation = money :(, so until someone finds some kind of business model that meshes with all my ideas this will be but a dream. But it would be totally worth it! +Casper Steinmann's latest paper, which was submitted to PLoS ONE in December has been revised and resubmitted. Grab the latest version of the manuscript at arXiv. So the response was somewhat late - the deadline is tomorrow - but a Ph.D.-defence came in the way. Luckily I only had to do one of those. Regarding the revised manuscript: We ended up doing single point energies using both B3LYP and MP2 and the cc-PVTZ and cc-pVQZ basis sets on the ONIOM calculations on chorismate if you're interested in suchs details. Especially the latter ones took a while. In a recent blog post, +Jan Jensen wrote that work on a semiempirical PCM interface was underway. At that time the energy calculations did work and solvation free energies (dG) we obtained for ammonium type cations are listed in the table below where we show the difference to Chudinov et al. (ddG) has an RMSD of 1.33 kcal/mol (a similar table with oxonium type cations the RMSD is roughly 2 kcal/mol). The original plan was to use numerical gradients to do optimizations but because I failed at naming a variable iat and not jat, numerical issues kept me from truly optimizing anything. Furthermore, the calculation of the electric field gradient using a numerical approach was very expensive. Instead of renaming iat to jat, I derived the analytical field gradient and implemented it only to find that the speed of calculating the gradient had improved greatly (a least two orders of magnitude) the optimization failures persisted because the field gradient I obtained numerically and analytically is pretty much the same. Lo and behold. Renaming iat to jat fixed the rest of my problems and I've optimized chignolin and tryptophan cage using PM3/PCM at a speed of about 10 sec/step and 60 sec/step, respectively. Both proteins required roughly 200 steps to be optimized from their crystal structure. 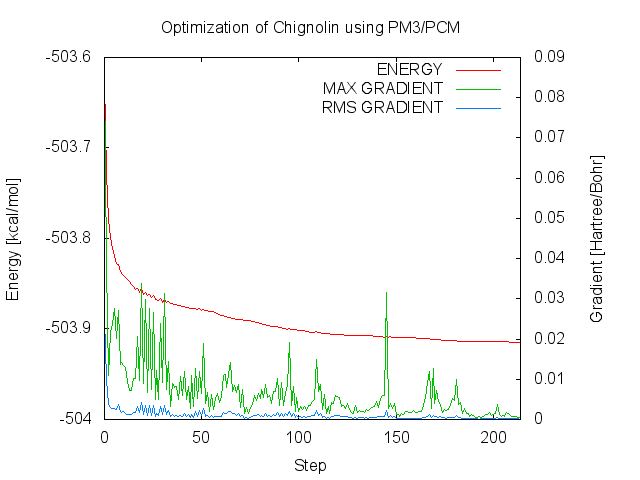 Here is a plot of the energy, maximum gradient element and the root mean square of the gradient for an optimization of Chignolin using PM3/PCM. So it looks like we're in good shape I guess. I know I am pleased. Note to self: what about anions? I used to think the Google Docs was completely unusable because I could get neither the fraction of superscript/subscript options to work. Then I found this video which explains that you have to use the tab key to switch from numerator to denominator in a fraction and the right arrow key for superscript/subscript. Either way the end result looks awful, but it's better than nothing. Please enter your name, e-mail address and query below, then click 'Preview and Send'. I submitted this mss more than 6 weeks ago. What is the status and when can I expect a decision? I have already been turned down by one reviewer and have sent out new invitations. To facilitate this process, additional reviewer candidates would be appreciated. Am I to understand that, after 6 weeks, the paper is not yet under review? It is under review. One reviewer has agreed and I have gone through three people who declined to review the paper. There is currently an invitation that was sent yesterday for which I have not received a response. I will be happy to withdraw the paper if you would like. I misunderstood your mail and I am happy to hear it is under review. I hope some of the other suggested reviewers will agree to review. It's been about a month since the last update on this manuscript. Is there any news? I wrote to you regarding an update on this manuscript two weeks ago but have not received a reply. Do you think we will get a decision within a week? If don't hear from you within a week please consider the paper retracted and then we'll try our luck somewhere else.